The perfect fusion of classic celtic pattern and contemporary metal wedding band ring. 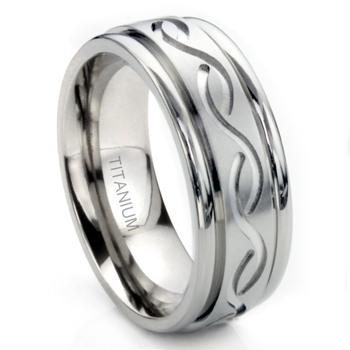 The celtic knot pattern going all the way around the entire ring, with shiny finish on the celtic design, contrasting the brush finish in the middle of the ring. This ring was beautiful & light weight & just what I wanted. Great customer service also & fast shipping. Would definitely order from again.